Roses , followed by other plays, including It's Never Too Late and Morning's at Seven , 1980. Died: 23 June 1998, in Scottsdale, Arizona, of a heart attack. "Maureen O'Sullivan," interview with Kingsley Canham, in Focus on Film (London), Summer 1974. Billips, Connie J., Maureen O'Sullivan: A Bio-Bibliography , New York, 1990. Bodeen, DeWitt, "Maureen O'Sullivan," in Films in Review (New York), January 1984. Hutchings, David, "Maureen O'Sullivan Finds Her Star Reborn Playing Mother to Her Daughter in Hannah and Her Sisters ," in People Weekly (New York), 14 April 1986. Maureen O'Sullivan's place in film history unfortunately has been relegated to that of an animal-skin-clad girl making a home for the king of the jungle. 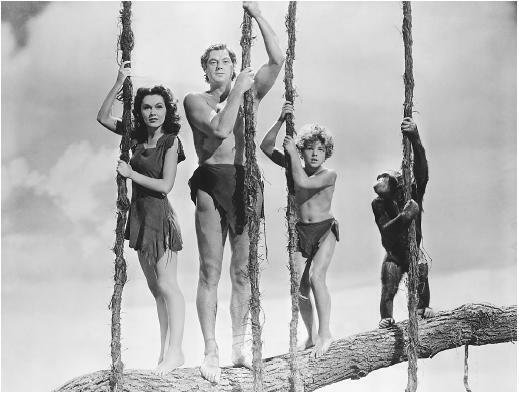 Although not her first film, Tarzan, the Ape Man was her first important role and her recitation of the words "Tarzan" and "Jane" (not "You Tarzan, me Jane" as so often misquoted) made her instantly famous to audiences worldwide. She appeared in several other Tarzan films with Johnny Weissmuller, but her contract at MGM also placed her in a large number of roles, usually playing the star's sister, best friend, or other secondary leads. She had a lovely speaking voice and a delicate beauty which suggested "well-bred young English lady" roles, such as the flighty Dora in David Copperfield , Henrietta in The Barretts of Wimpole Street , and the oldest sister, Jane, in Pride and Prejudice . In the 1940s, when O'Sullivan was still in her prime and very active in films, she semiretired from acting to be a mother to her large family and a wife to the writer-director John Farrow, with whom she worked in the 1948 thriller The Big Clock . The marriage lasted until Farrow's death in 1963 and produced, among its seven children, the actress Mia Farrow. During the 1950s O'Sullivan made a few films and did some television work, but she did not have any important roles until after John Farrow's death when she went to Broadway and starred in the successful comedy Never Too Late . After the long run of the play, it was turned into a film in which O'Sullivan again played opposite her Broadway co-star, Paul Ford. In the film, a gentle comedy, Ford and O'Sullivan, the middle-aged parents of a married daughter, discover that they are going to have another baby. Although she was well into her fifties, O'Sullivan was still very attractive and displayed a fine sensibility for light comedy, something which she seldom, if ever, was able to do as an ingenue. In the 1980s, O'Sullivan's screen career was briefly jump-started in Woody Allen's Hannah and Her Sisters , cast as the mother of the character played by daughter Mia. Later on, she became a vocal supporter of her daughter (and denouncer of Allen) in the wake of the notorious Soon-Yi affair.